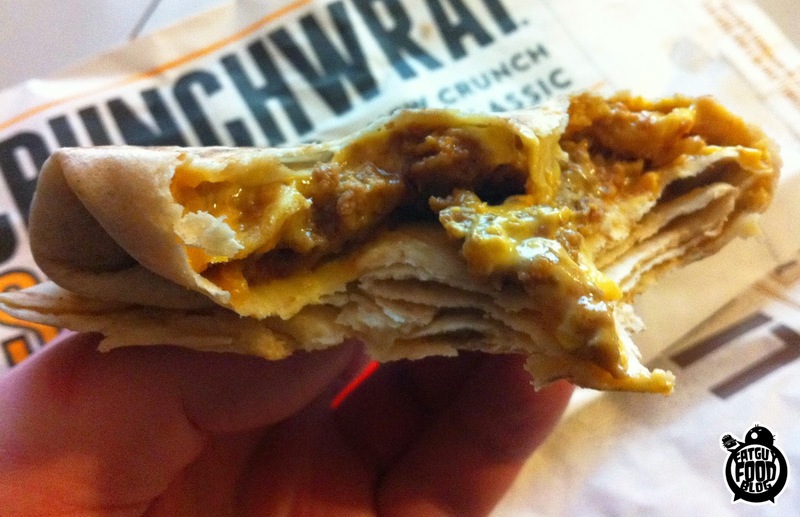 Taco Bell's New Crunchwrap Sliders! The resident FGFB Taco Bell reviewer (FGFBTBR) is back. 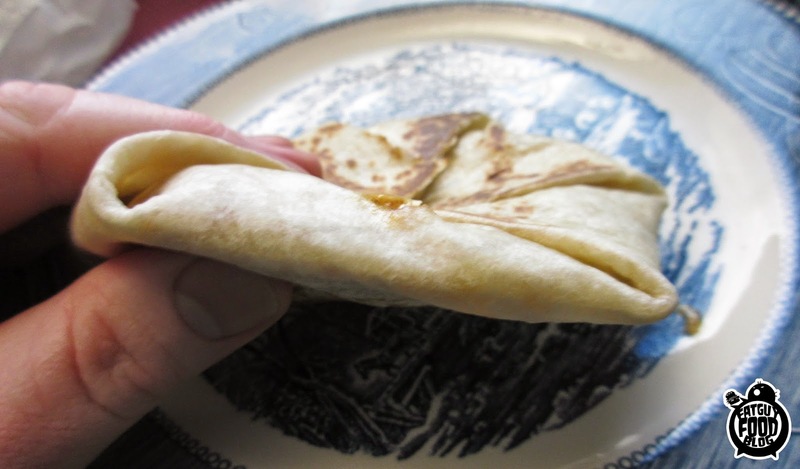 As someone who never really ate a lot of Mexican food growing up, I have certainly gone to Taco Bell a lot recently, due to their huge breakfast menu and their sudden passion for Crunchwraps. Hey, when you find something that works, you stick with it. Good job for recognizing you have something special, Taco Bell. 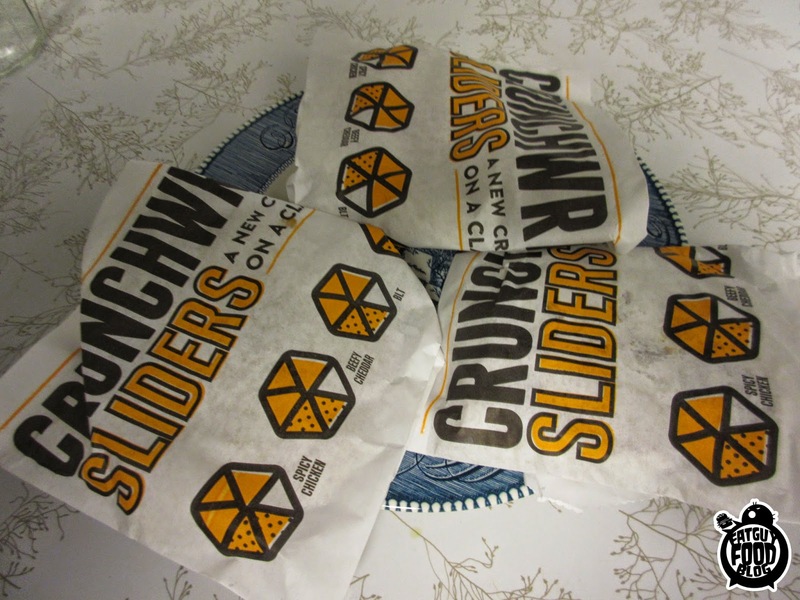 Their next step with that special something was to create 3 new Crunchwraps, but this time they're "sliders," and they're a lot cheaper. I had no idea which was which, so I started with... something. First off, I'm 99% sure these are the same size tortillas they use for their bigger Crunchwraps, and they fold them the exact same way. They're just much thinner because they don't have a hash brown filling them up. While they usually have eggs to fill them up too, it was pretty funny to realize how much of a Crunchwrap's mass is from that hash brown. But you're getting a real deal on tortillas, since these were cheap and a regular Crunchwrap can get up to around 4 bucks. I bit into the first one and found out that it was the Spicy Chicken one. 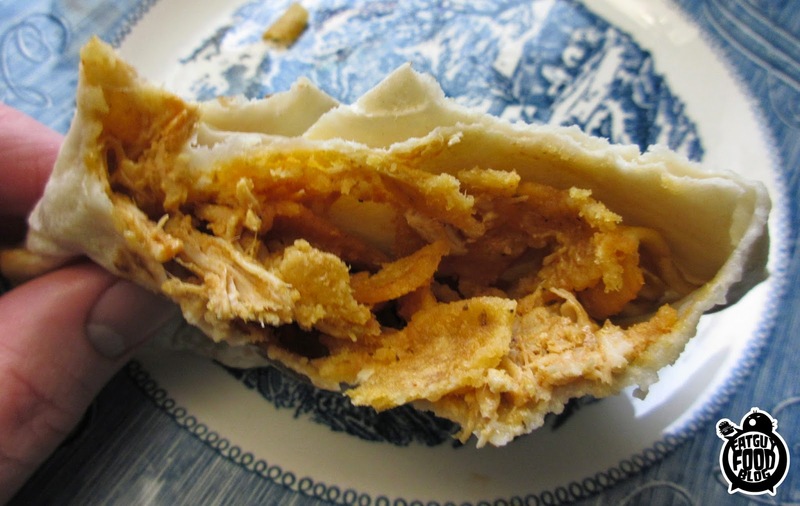 This is just marinated chicken, Fritos chips, and a creamy chipotle sauce. First off, I LOVE that there are Fritos in these. Bravo Taco Bell. Bravo. This was a little blah though. The chicken was pretty dry, and I made the mistake of getting these when I wasn't able to eat them right away. I re-heated them in the microwave, not thinking about the Fritos. Chips without crisp are not very good. But I was able to ignore that and focus on everything else. If this had had more sauce, my rating would be much higher, since the sauce is absolutely fantastic and is really necessary to help the dry blahness of the chicken. If I get this again, I'll order extra. As this was, I'll give it a C. It needed more sauce, and more importantly, it needed cheese. I'll pay more, it's ok. Just give me cheese. Next up was apparently the Beefy Cheddar Crunchwrap Slider. Why this has cheese in it and the chicken one doesn't is beyond me, because the cheese in this made it. I've never been a fan of that standard taco-seasoned beef, and my initial displeasure led to me ignoring Mexican food for most of my life, not realizing that everything else other than taco seasoning is pretty damn good. So, this unfortunately has a lot of seasoned beef. 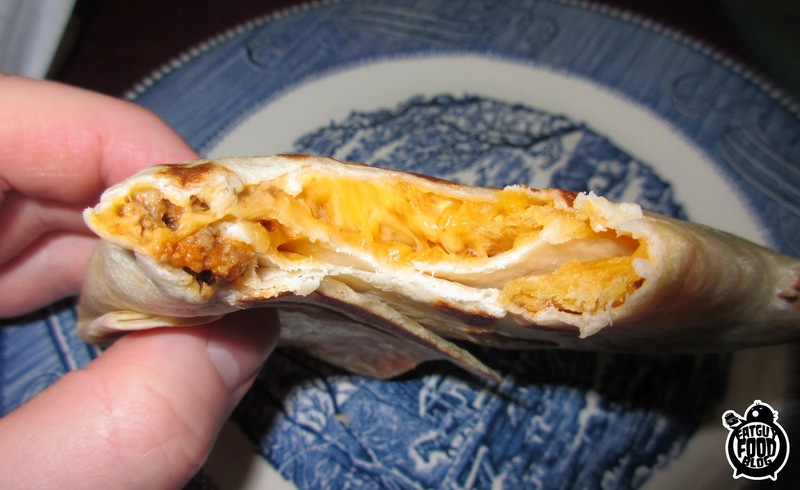 But it also has Fritos, cheddar cheese, AND warm nacho cheese, which really made a difference. It was creamy and gooey in all the right ways something like this should be. I even went back and got another one on a different day so I could taste it with the crunch of the Fritos. As expected, this made it way better and helped give some texture to something that would have otherwise been goo. I'll give this a C as well, but only because I'm not a fan of the beef. If you are though, this is absolutely something you need to get. 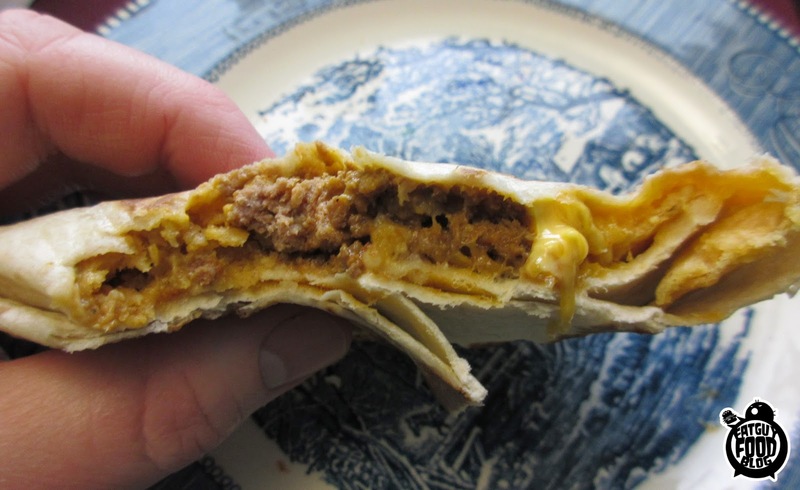 The nacho cheese and melted cheddar rule. Put that on the chicken, Taco Bell! WTF! 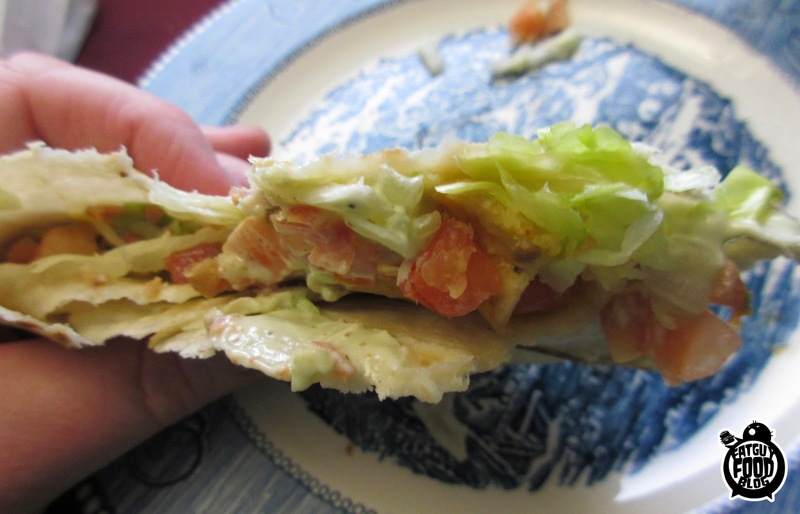 So the last one up was actually the one I was most excited to try- the BLT Crunchwrap Slider. 2. Where can you get a BLT (sort of) sandwich for a buck? This has exactly what you'd expect, except it also includes Fritos and an Avocado Ranch sauce (?!). I mean, look, this is dollar menu food at Taco Bell. This is not going to replace a BLT sub from that awesome sandwich place in the next town, or even your own homemade BLT with huge strips of bacon. But for the price and location, this is an awesome little creation. It falls apart quite easily (there's no solid mass to keep it together), but if it does, just make a little roll up like I did. The tomatoes taste great, the lettuce is there, the bacon is suprisingly flavorful and awesome, and the chips add an awesome bonus flavor and crunch. And the avocado ranch sauce (which, gun to my head, I would tell you was just ranch) is delicious and adds an awesome flavor. Who knows, maybe the secret avocado is what ties this whole thing together. I love this thing and will absolutely be getting them until Taco Bell decides to take them off the menu, which will probably be way too soon. Hopefully, at least this one lasts. A.
Spicy Chicken: Needs cheese and more sauce, but not bad. C.
Beefy Cheddar: Terrific if you love taco-seasoned meat, otherwise just ok. C.
BLT: If you like BLTs, ranch and Fritos (why wouldn't you like all of those? ), get this. A. 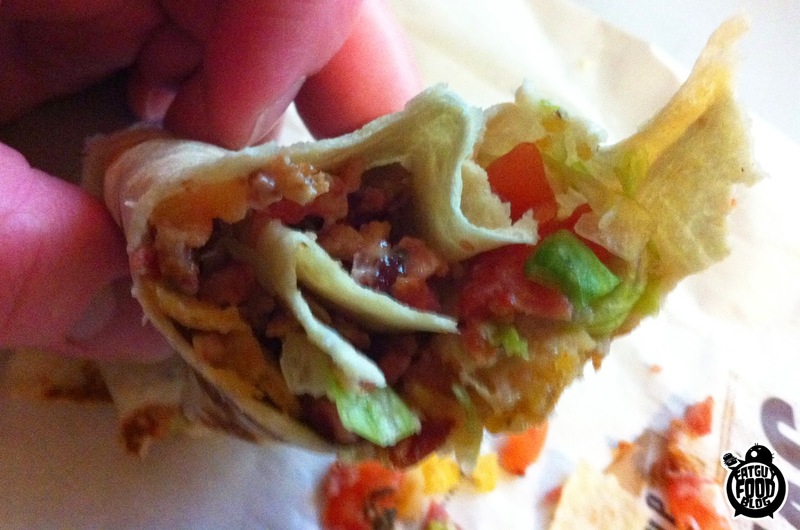 One HUGE complaint though- Don't lie to me, Taco Bell. You said these were a buck each in the commercials, and you said they were a buck each on the website. I've bought these at 2 different Taco Bells in 2 different states, and they are not a dollar. They are $1.29. So either stop lying, or force the Taco Bells in Woburn, MA and Somersworth, NH to give me a lot of food for free since they're overcharging me (I'd prefer that). Thanks. Have something you think we should review? Spot some new snack out in the wild and think we need to know about it? Just want to write in and tell us how much we rock? COOL. You can email us at fatguyfoodblog@gmail.com. Also, we are on twitter: @fatguyfoodblog. You can even LIKE our facebook page, we do some fun stuff over there sometimes! 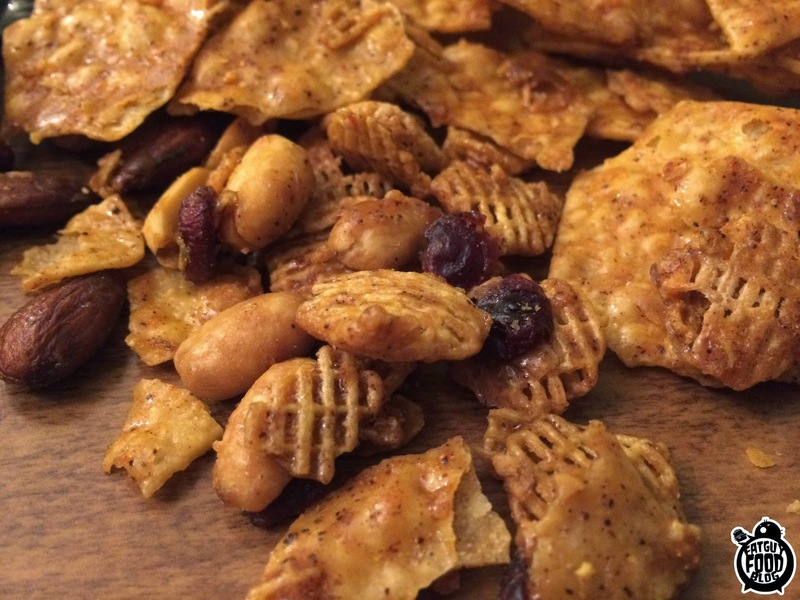 It's Freakin' Awesome Snack Mix! You know what? It really is freakin' awesome. There are a million snack mixes out there. From Chex Mix, to Munchies, to Cheez-Its snack mix, Heck, they even make Captain Crunch snack mixes. So if you're going to get into the snack mix business, you need something that's going to set you apart from the rest. So not only does your actual mix have to dazzle taste buds, but you also have to have some sort of gimmick that's going to grab snackers and not let go. I'm happy to say that Freakin' Awesome Snack Mix has both of these things. First off, the ingredients. Freakin' Awesome Snack Mix is a delightful array of things. 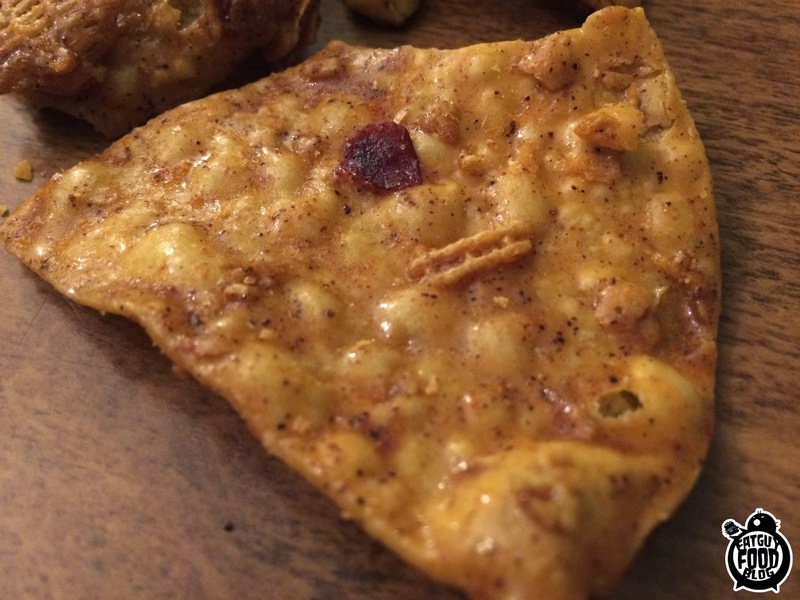 It has peanuts, almonds, dried cranberries, what appears to be a Crispix-like cereal, and caramelized tortilla chips. Whatever they use to caramelize the tortilla chips is also on the rest of the stuff, so it does a great job tying it all together. You get a sweet burst from the cranberries, two distinct different crunches and textures from the peanuts and almonds, and the cereal holds onto a lot of the flavor around it. But I'm not going to lie to you. There's one part of this that outshines the rest and that's the caramelized tortilla chips. At first, THEY ARE WEIRD. You kind of don't know if you like them or not. 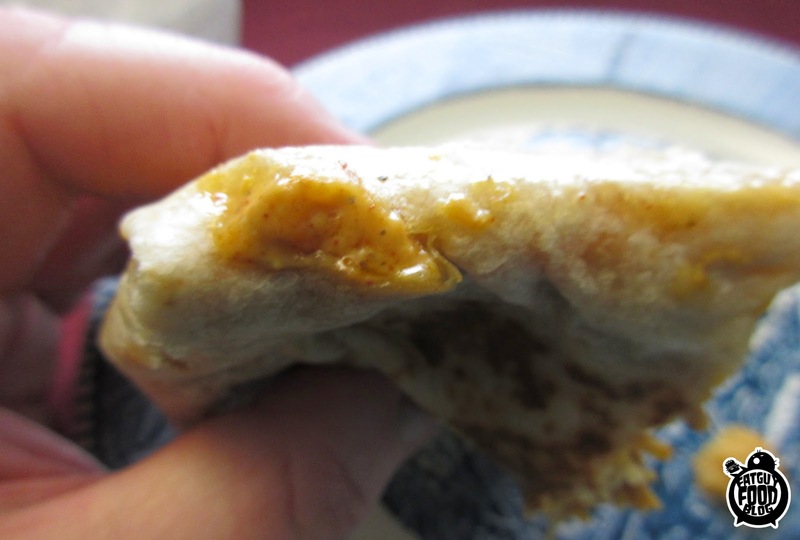 It's a burst of sweet followed by a strange spicy/cheesy flavor. But then you finish that first chip and your brain pauses for a moment and then screams, "THAT WAS WEIRD. LETS TRY ANOTHER!" Then after this happening a few times you realize that not only do you like the chips, but you freakin' LOVE them. These puppies are the real star of the show. So there you have it. You know we deem the mix to be great. But what else does this have going for it? Well it's got a solid gimmick that it not only jumps out at you, but they shamelessly use it at every chance they get. When you read the bag, you can find FREAKIN' and AWESOME easily 400 times in a quick glance. It's great. Even their website runs with the gimmick: http://www.itsfreakinawesome.com/ ! Excellent, unique snack mix and a solid gimmick! I would highly recommend you give this a try. 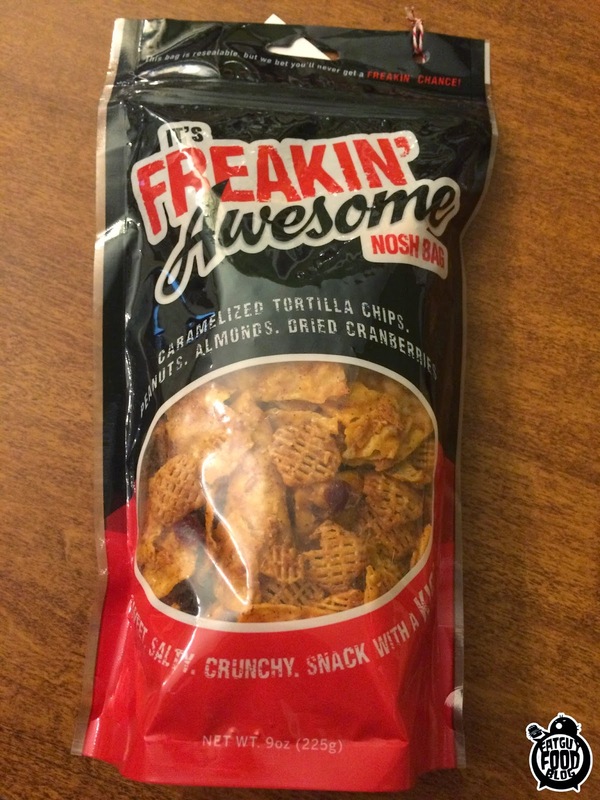 I give It's Freakin' Awesome Snack Mix an A! I ate the entire bag in a span of two days and don't feel bad about it in the least. It was delicious and I'm planning on ordering some asap, unless of course perhaps some more showed up at Fatguyfoodblog headquarters. You never know! You can order yourself some of this mix here: http://www.itsfreakinawesome.com/ . Don't forget, we love to read emails from our readers! Have something you think we should review? Spot some new snack out in the wild and think we need to know about it? Wondering how that new menu item at your local fast food joint is and want us to tell you? Just want to write in and tell us how much we rock? COOL. You can email us at fatguyfoodblog@gmail.com . Also if you'd like we are on twitter : @fatguyfoodblog . Heck, you can even LIKE our facebook page, we do some fun stuff over there sometimes!